The WBC believes in transparency and administrative disclosure. WBC annual convention meetings determine world rankings and the mandatory status of each division in open floor meetings, and are formally voted by the Board of Governors. The WBC began to report this information in 2015 to bring clarity and transparency to the WBC’s administration to the public. The report presents: The rulings from the convention in bold letters, and related events throughout the year. HEAVYWEIGHT: Champion Deontay Wilder will make a voluntary defense against Tyson Fury No. 3 ranked on December 1, 2018. Dillian Whyte presented an appeal to be appointed as mandatory contender; his claim will be addressed with the corresponding protocol. Dominique Breazeale to fight the winner of Wilder vs. Fury, which will be the mandatory defense. The WBC approved a direct rematch and will create a ruling, which will also consider the mandatory status of the division. Dillian Whyte defeated Dereck Chisora by KO11 in a defense of his silver title on December 22 in the U.K.
Free negotiations for Wilder vs Fury rematch have been ordered and if no agreement is reached a purse bid will be held on February 5. With the WBC order of the Wilder vs. Fury rematch, the mandatory status of the division is under process by WBC Board. CRUISERWEIGHT: Champion Oleksandr Usyk, who won the World Boxing Super Series, will fight Emeritus champion Tony Bellew on November 10 in Manchester. Tarik Saadi requested that his boxer, Ilunga Makabu, be approved to fight a semifinal fight against Dmitry Kudryasho; it was approved. WBC will support WBSS Season II with Diamond belt. Oleksandr Usyk defeated Tony Bellew by TKO8 on November 10, in a voluntary defense of champion. Mairis Briedis defeated Noel Gevor by UD12 for the Diamond on November 10 in Illinois. Maxim Vlasov vs. Krzysztof Glowacki. Vlasov fought for the title of another organization and the silver title was declared vacant. WBC supports unified champions and will look into the mandatory situation with all organizations, trying to find a common mandatory contender and avoid multiple mandatories. LIGHT HEAVYWEIGHT: Champion Adonis Stevenson will fight interim champion Oleksandr Gvozdyk on December 1, 2018, in a mandatory and unification fight. Badou Jack is the mandatory contender and will fight the winner of the unification fight. Oleksandr Gvozdyk defeated Adonis Stevenson by KO11 and won the undisputed title on December 1, 2018. Badou Jack vs. Marcus Browne will fight for the silver title and the winner will be mandatory. Oleksandr Gvozdyk will make a voluntary defense vs. TBA in March. Marcus Browne defeated Badou Jack by UD12 on January 19, capturing the WBC silver and is now the mandatory challenger of the division. SUPER MIDDLEWEIGHT: David Benavidez will be placed as “Champion in Recess” after testing positive in CBP and the title is vacant. Benavidez will be supported by the WBC on all aspects for his rehabilitation. Diamond champion Callum Smith defeated George Groves by KO7 on September 28 and won the final of the WBSS. Eddie Hearn informed that the next defense of the Diamond Championship of Callum Smith will take place in March or April. Anthony Dirrell is the mandatory contender and the WBC Board ordered Dirrell vs. Avni Yildirim for the vacant title on February 23, 2019. Azizbek Abdugofurov defeated Wuzathi Nuerland by UD12 for the silver on November 18, 2018. Canelo Alvarez defeats Rocky Fielding by TKO3 in a special event on December 15 in New York. MIDDLEWEIGHT: Champion Canelo Alvarez won the title on September 15 to Gennady Golovkin. Interim champion Jermall Charlo is the mandatory contender. 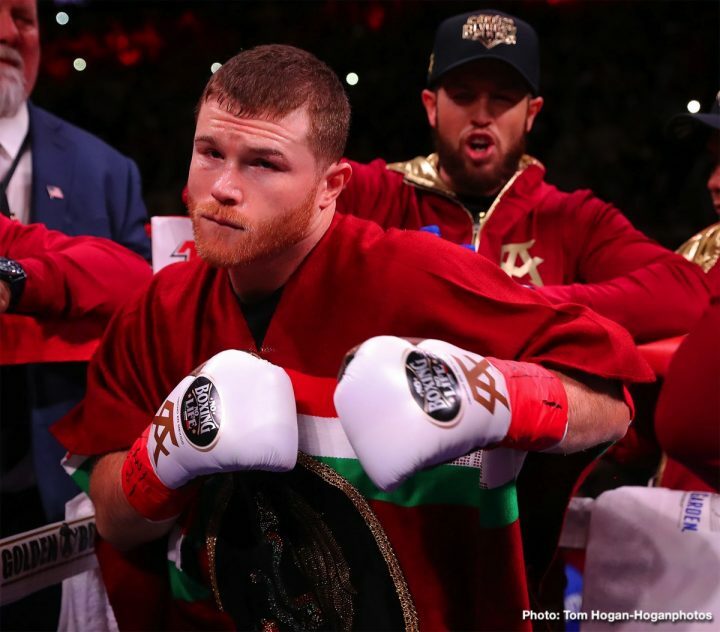 Canelo Alvarez granted one voluntary defense. Tom Loeffler requested a direct rematch between Saul Alvarez and Gennady Golovkin. Charlo will fight mandatorily with Gennady Golovkin for the interim; the winner becoming mandatory contender for Alvarez. Jermall Charlo defeated Matt Korobov by UD12 in a defense of the interim champion, on December 22. Hassan N’Dam defeated Martin Murray by MD12 for the silver on December 22. Canelo Alvarez will make his voluntary defense on May 4 vs Daniel Jacobs. SUPER WELTERWEIGHT: Champion Jermell Charlo made two mandatory defenses and now is in voluntary stage. A final elimination between number 1 Julian Williams and number 2 Erislandy Lara was ordered for the next mandatory contender. The final elimination was cancelled as both Lara and Williams withdrew. Tony Harrison defeated Jermell Charlo by UD12 and won the super welterweight title on December 22. The WBC ordered a direct rematch between Tony Harrison and Jermell Charlo. Sergey Vorobiev vs. Hassan Mwakinyo – Silver and final elimination. Roberto Garcia vs. Liam Williams for the Silver. WELTERWEIGHT: Champion Shawn Porter won the vacant title against Danny Garcia and must make two mandatory defenses. Andre Berto is mandatory challenger. Yordenis Ugas is mandatory challenger. Keith Thurman right to fight for the title. Jessie Vargas fought Thomas Dulorme for the silver title; it was a draw. The WBC ordered a rematch fight between Jessie Vargas and Thomas Dulorme for the Silver title. The purse offer scheduled for December 21 was cancelled, as no promoter participated in the process. Shawn Porter vs. Yordenis Ugas on March 9. Danny Garcia vs. Adrian Granados for the Silver. Mikey Garcia will fight Errol Spence for the WBC Diamond. SUPER LIGHTWEIGHT: Champion Jose Ramirez made a voluntary defense on September 14, 2018 and is in voluntary stage. Regis Prograis, interim champion, will fight Terry Flanagan on October 27 in the WBSS. Josh Taylor will defend his silver title against Ryan Martin in the WBSS. A final eliminator fight was approved between Adrien Broner and Jorge Linares, provided they comply with the WBC Code of Ethics. No. 4 Viktor Postol vs. No. 5 Mohamed Mimoune was approved as semifinal elimination. Regis Prograis, defeated Terry Flanagan by UD12 on October 27 in the WBSS to become Diamond champion. Josh Taylor, Silver champion, defeated Ryan Martin by TKO7 in the WBSS on November 3 in Glasgow. The ordered fight between Adrien Broner and Jorge Linares was cancelled, as both declined and took other fights. Jose Ramirez vs. Jose Zepeda – voluntary on February 10. Josh Taylor vs. Ivan Baranchyk for the Silver. LIGHTWEIGHT: Champion Mikey Garcia is in voluntary stage. Luke Campbell is the mandatory challenger. Javier Fortuna vs. Zaur Abdullaev was approved as semifinal elimination. Mikey Garcia will fight Errol Spence in the welterweight division. SUPER FEATHERWEIGHT: Champion Miguel Berchelt is making his mandatory on November 3 against Miguel Roman. Francisco Vargas vs. Rocky Hernandez was approved as a final eliminator. Miguel Berchelt defeated Miguel Roman by KOT9 in a mandatory defense on November 3. Berchelt will fight Francisco Vargas in a voluntary defense. FEATHERWEIGHT: Champion Gary Russell Jr. made his mandatory on May 19, 2018 against Joseph Diaz. Diamond champion Leo Santa Cruz was appointed as the mandatory contender for the champion. Claudio Marrero, No. 4 against Tugstsogt Nyambayara, top ranked contender as a final eliminator. Muhamad Ridhwan vs. Paulus Ambunda for the Silver on March 29. SUPER BANTAMWEIGHT: Champion Rey Vargas is currently under medical treatment. Abigail Medina vs. Tomoki Kameda will take place on November 12 for the interim title. Tomoki Kameda defeated Abigail Medina by UD12 and won the interim title on November 12. Rey Vargas vs. Franklin Manzanilla on January 26. Winner must fight interim champion Tomoki Kameda next. Nordine Oubaali and Rau’shee Warren will fight for the vacant on January 19. Petch Sor Chitpattana is the mandatory contender; he accepted a step aside fee. Takuma Inoue vs. Petch Sor Chitpattana for the interim on December 30. The winner to fight the winner of Oubaali vs. Warren. Luis Nery defeated Jason Canoy by TKO3 and won the Silver title on October 6. Takuma Inoue defeated Petch Sor Chitpattana by UD12 and won the interim on December 30. Nordine Oubaali defeated Rau’shee Warren by W12 and won the vacant title on January 19. Oubaali will fight Inoue for undisputed WBC bantamweight title. Srisaket Sor Rungvisai vs. Juan Francisco Estrada mandatory. FLYWEIGHT: Champion Cristofer Rosales made a voluntary defense on August 18, 2018. Cristofer Rosales vs. Charlie Edwards – voluntary on December 22. Wulan Tuolehazi defeated Jayr Raquinel by UD12 and won the vacant silver title on September 28 in China. Andrew Selby vs. Julio Cesar Martinez was approved as a final elimination. The winner will fight the champion. Charlie Edwards defeated Cristofer Rosales by UD12 and won the flyweight title on December 22. LIGHT FLYWEIGHT: Champion Ken Shiro defeated Milan Melindo by TKO7 in a voluntary defense on October 7. His last mandatory was on May 25, 2018. Ken Shiro vs. Saul Juarez voluntary on December 30. A final elimination fight between number 1 Jonathan Inguito Taconing and number 2 Hiroto Kyoguchi was approved – purse offer November 30. Hiroto Kuyoguchi decided to fight for the title of another organization. Jonathan Inguito Taconin was named as official challenger. Jing Xiang defeated Suriyan Satorn by D12 and won the Silver title on January 5 in China. Ken Shiro defeated Saul Juarez by UD12 in a voluntary defense on December 30 in Japan. MINIMUMWEIGHT: Champion Wanheng Menayothin made his last mandatory defense on May 2, 2018 and a voluntary on August 29. An elimination fight was approved between No. 1 Simpiwe Khonco and No. 2 Tsubasa Koura – purse offer January 8.